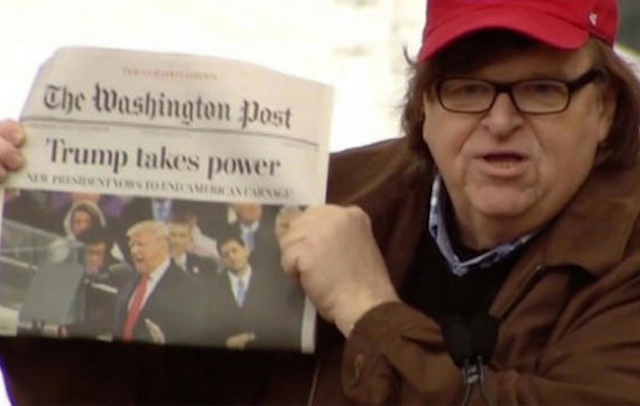 The impression of Michael Moore, in the 14 years since his influential “Fahrenheit 9/11” (the highest grossing documentary of all time) is that of a lost grump. His output from there has been interesting (“Sicko”) to unfocused (“Where to Invade Next”). He is still a scapegoat for the FOX News crowd, his mere name is meant to evoke anger in them. Yet his public persona had gotten as soft as his belly… he just didn’t seem to have the filmmaker’s energy that launched him as a working man’s advocate. Then along came one of the most horrible stories of the last ten years, which was the poisoning – through government-approved greed – of the residents of Flint, Michigan (Moore’s hometown) through the switching of their water supply. He spends a lot of time on this story in “11/9,” which is a basis for his thesis of both patches of optimism (Parkland student uprising) and dread horror (how the Nazi party used similar techniques as Trump and the Republicans). But Trumpers note, Obama does not get a pass either. “Fahrenheit 11/9” begins with a recap of November 9th, 2016, when in the wee small hours one of the greatest upsets in political history occurred… the defeat of Hillary Clinton by Donald Trump in the race for president. Director Michael Moore actually predicted that victory, sensing the discontent in the majority of voters who voted… the doc points out that 100 million eligible voters stayed home. The rest of the story has three parts – the water issue in Flint, the political backlash (largely optimistic) against the president by new advocates around the country and (most scary) the similarities between the rise of Nazism in Germany and the rise of Trumpism. In putting the three of these parts together, the story becomes a question as to how “we the people” will steer the future. What kind of nation will we become?